Grand Master, Dr. Key Chun Song, is a doctor of acupuncture, traditional herbal medicine, and Qi Gong healing and meditation. He is also a ninth degree black belt in traditional Chinese kung-fu in Korea, Taiwan as well as Hong Kong and has over 50 years of martial arts experience. Grand Master Song was born in 1945 in Seoul, Korea and spent most of his early life in the South Korean capitol. Growing up in the tumultuous post WWII and Korean War era, young Master Song was confronted with many societal challenges. At an early age he was introduced to the martial arts systems of Judo, Kendo and Tae Kwon Do. Both his maternal grandfather, Wan Ho Li, and paternal grandfather, Lak So Song, introduced him to Qi Gong meditation and the healing arts of herbal medicine and acupuncture. Master Song shared that while growing up malnourished in post War Korea, it was his grandfather's "daily herbal teas that strengthened [his] body" and helped him get through a difficult early childhood. Master Songs' grandfather, Lak So Song, was not only a doctor of herbal medicine and teacher of meditation, but also a founder of the Korean Christian Church. It is to his father and grandfathers that Grand Master Song attributes much of his early training in the family tradition of herbal medicine and acupuncture. Grand Master Song continued his training in the healing arts in Seoul, Korea at Kyung Hee University, and later, in the U.S. at South Baylo University. In Korea, at an early age he was fortunate to have met the grandfather of a friend, Chinese national Jiao Pu Tien, who had relocated from Shantung Province. After repeated requests, at the age of thirteen, Jiao Pu Tien took Master Song as his student. Master Song was taught traditional kung-fu, emphasizing discipline, respect and honor. It is to Jiao Pu Tien's teaching that Master Song attributes much of his growth as a martial artist and individual. In the 1970's Grand Master Song made many trips to Taiwan and Hong Kong. In addition to being a high ranking member of the Seoul, Korea Kung-fu Association, Master Song became affiliated with the Taipai, Taiwan Guo Shu Ha Martial Arts Association and the Hong Kong Kung-fu Association. He also continued to develop his skill and ability as a doctor of traditional Chinese medicine and gained further knowledge of traditional Chinese Kung-fu Through an interchange of skill between masters in Taiwan and Hong Kong. While in Korea, Grand Master Song led the Korean national kung-fu Team as the head instructor. They competed on the international stage in Hawaii in 1980 against Taiwan, Hong Kong, The United States and other national kung-fu teams. 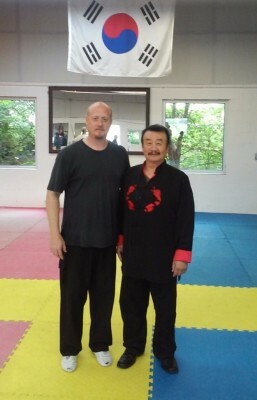 Later, after meeting his wife, an American Christian missionary in Korea, Grandmaster Song moved to the United States in 1980 to open and head the official branch of the Hong Kong Martial Arts Association and the Taiwan Gou Shu Ha Associations in the United States, known as the United States Midwest Kung-fu Association. Not only is Dr. Song a licensed pharmacist with the Seoul, Korea Pharmaceutical Association, but an acupuncturist and doctor of traditional Oriental medicine in the United States, licensed in Illinois and Florida. He currently owns and operates two martial arts academies and acupuncture clinics in Champaign as well as Chicago, Illinois. Grand Master Song teaches his students and serves his patients with a wealth of knowledge and experience, not only with expertise and mastery, but with humility and a warm smile. Master Song says, "We learn through martial arts the training of our body both internally and externally. We train together as a group and make together a family. Most important is our heart and to respect each other, harmony with life, that is what I want." Just as he finds a balance between the internal and external systems of kung-fu, Master Song finds a balance between humility and experience, gentleness and strictness. Grand Master Key Chun Song is a martial artist of vast knowledge, skill and power. He is a doctor, philosopher, teacher, father-figure, Grand Master and inspiration to us all.